With all of the cool tiny houses being built these days, it’s fun to see some of the creative ideas people come up with. 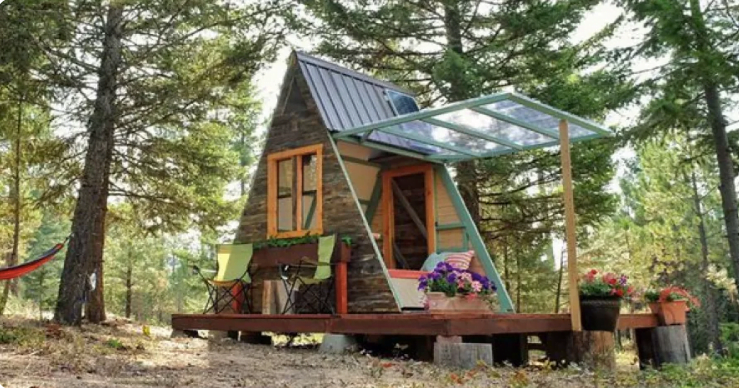 This tiny house built from the inspiration a popular tiny house builder might be one of the cutest and most practical builds, plus it also gets points for being an affordable build too. The original tiny house design was created by well-known tiny house builder Derek “Deek” Diedricksen, then Alla and her husband Garrett, built the tiny house themselves on their property in Missoula, Montana. Deek built his version of the tiny house design for $1,200, but the couple was able to cut down the cost of their tiny house project to only $700. They did this by using a lot of repurposed materials. All of the window frames, nails, plywood, and logs were items they had around their property. Since the couple already loved doing DIY projects, the tiny house was just another fun project they decided to take on to create a guest house on their property. They were able to complete the tiny house in just three weeks which is pretty impressive. What they have now is a very charming little guest house where they can host friends or family. Some people even rent out tiny houses like this on Airbnb as well. Nestled in some trees on their property, the house is private from the other buildings on their land including their own home where they live full-time. The home is set on a raised wooden patio with enough space to sit out on chairs and enjoy the scenery. There are also some hammocks hanging from nearby trees to lay out in to enjoy a gentle swing. One of the greatest things about this tiny house design is the wall that lifts up and out from the tiny house which expands the space inside. This wall is also made completely out of corrugated plastic siding, so it’s transparent which will allow light and views in no matter if it’s closed or open. The space inside is quite tiny, but there are two single beds which can be pushed together or left apart to sleep two people comfortably. There isn’t a bathroom or running water, but there is an outdoor toilet and a solar shower. They do provide their guests with some filtered water and some basic dishes and cutlery if they wanted to have their own meals or snacks out there. Besides the opening wall, there is another small window and a door to lead outside if the wall panel needed to stay closed. If you’ve been dreaming about building a tiny house to use as a guest house on your own property, this tiny house design could be the one you use. It’s very easy to build, and you have to love how affordable it is too, especially if you’re using recycled materials. To look for some recycled materials, your best bet is to go on some online buy and sell groups and look in the renovation section of the adds. You could even post and add of your own stating what you’re looking for and that you’re building a tiny house. It might surprise you what people would be willing to offer up. To find the exact plans that the couple used to build their tiny guest house, you can visit Deek’s website which is Relaxshacks.com where he shares tons of great advice on building a tiny house from scratch using recycled materials. He also shows how to build tiny houses to live in full-time as well and has a YouTube channel where you can get tours of the homes he has created as well as information about his tiny house building workshops.